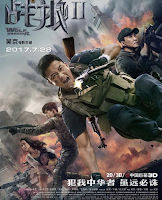 Movies are big business in China too the tune of $15.8 Billion in February – a record breaking performance even ahead off the best US monthly which the magazine reported as $13.95 Billion in 2011. The PLA has been a big and successful backer of war movies having sponsored the current hit, Operation Red Sea (which also features the Chinese Navy), Wolf Warrior 2 (at left) last year which was SF themed and of course a PRC Top Gun – Sky Hunter. Military produced films have ‘covered’ a number of conflicts (in Chinese terminology) such as the War of Resistance Against Japanese Aggression (1931-45), China’s Civil War (1945-59) and the Korean War (1950-53). The settings have evolved along with the PRC’s needs and messages moving into more modern conflicts and showcasing the PRC’s military prowess. 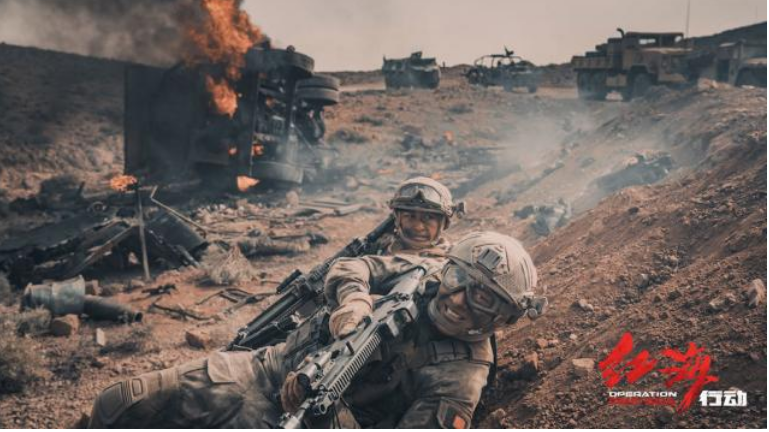 Operation Red Sea is being lauded as the first of a new generation of Chinese War movies. Like their Western Counterparts, Chinese war movies did not appeal to the younger generation of moviegoers. This resulted in transferring responsibility to a new segment of the PRC government. A key element is to stimulate pride in the PRC military and China’s newly elevated international status. Alas these things don’t happen in America. Hollywood is after box office, and while some moviemakers will tout their social progress philosophy or protest purposes ultimately the free film market is about box office and maybe a bit about “Oscar”. What are the lessons to be learned for the PSYOP Community? Actually those lessons would be more DOD focused to include working with filmmakers to insure realism and to do what can be done to influence a balanced perspective. Fake news is perhaps more common these days than ‘real news’. 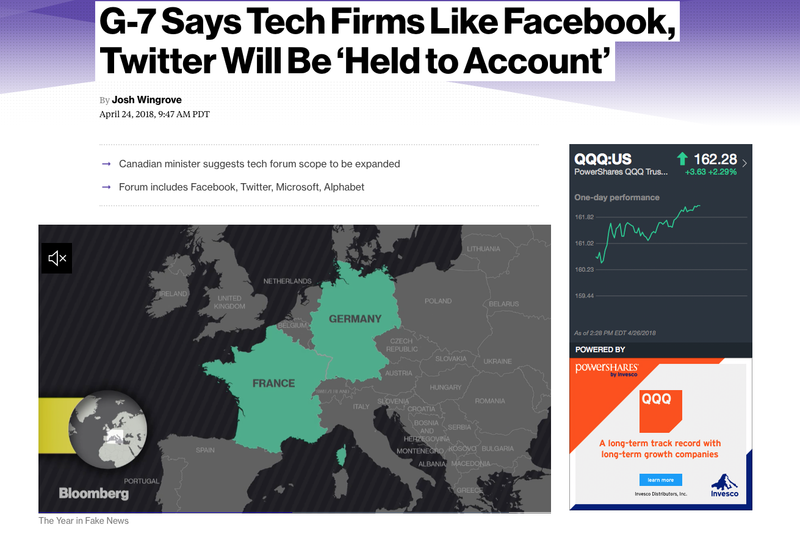 On April 24, 2018 Bloomberg Politics reported “G-7 Says Tech Firms Like FaceBook and Twitter Will be ‘Held to Account’. (see: https://www.bloomberg.com/news/articles/2018-04-24/tech-firms-like-facebook-twitter-to-be-held-to-account-by-g-7; which is also the photo source. I wondered just how hard it would be for two people to create their own disinformation (fake news). As many of you know, I regularly participate in joint exercises as the IO SME and Role Player. In my most recent exercise I worked with a colleague to create two streams of disinformation. At first I thought the idea of planning and executing a disinformation campaign would be pretty daunting. Frankly – it’s not. Our targeting mission was pretty simple. It would be our job to confuse the friendly Public Affairs Team and Media Operations Center (MOC). Our first step was to pick our media. We decided to concentrate on a single media so that we could concentrate our efforts. Fortunately the exercise takes place in a closed, off the net, isolated system so we were not unduly concerned with leakage. Next we adopted a fictional persona. Just as if we were in a play we did a mini-character analysis of our new identity and developed what we believed would be the key messages they would want to transmit. Once we knew who we were portraying and what we wanted to say we created a couple of story lines and drafted messages. Our finally step was to create a time to inject each message. Our chosen medium was a Tweeter Take Off - this meant we had to limit what we could say to remain inside the character limit. The end result was that the students spotted one of our characters and crafted some very responsive counter-propaganda messages. The other character slipped through the cracks and was never picked up. The key to success was a combination of creativity and sensitivity to the situation so that your disinformation campaign is credible and blends in with the rest of the journalistic landscape. While many argue that Social Media is very noisy, no one would argue that it is not influential, nor that imagery is the most potent way to influence someone. 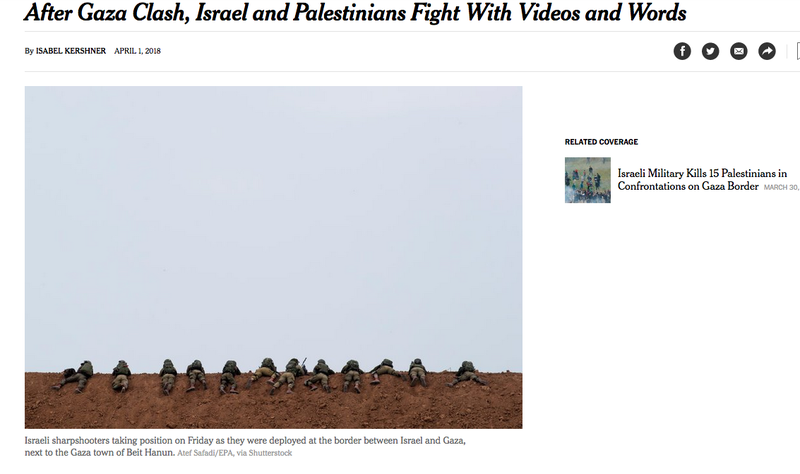 An April 1, 2018 article in the NY Times (see: https://www.nytimes.com/2018/04/01/world/middleeast/israel-gaza-fighting.html, Photo at Right) addressed how Israel and the Palestinians are both battling in the court of world opinion using dueling videos. 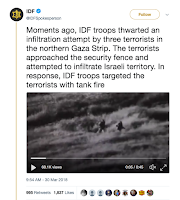 According to the article, Israel produced a video which you can see for your self at: https://www.nytimes.com/2018/04/01/world/middleeast/israel-gaza-fighting.html. 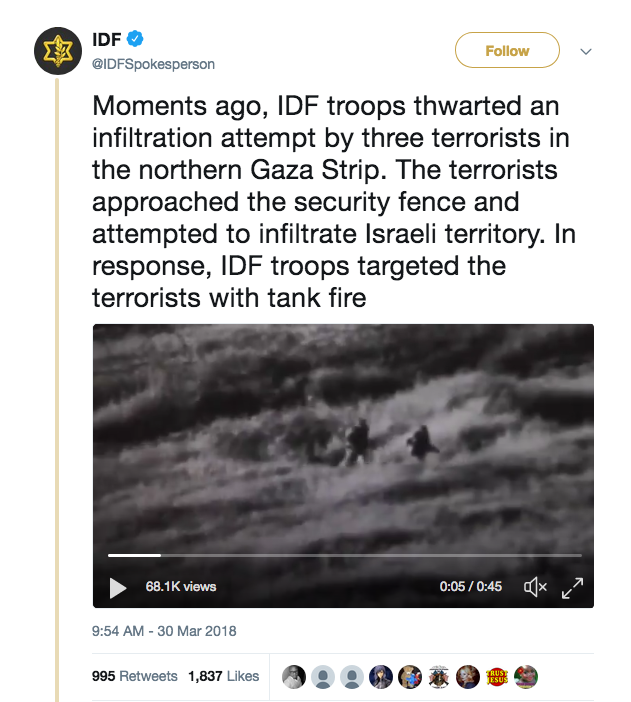 This video claims to show Hamas fighters. Still below. 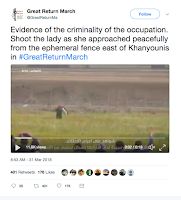 Not to be out done, Hamas purports show unarmed protesters being shot. 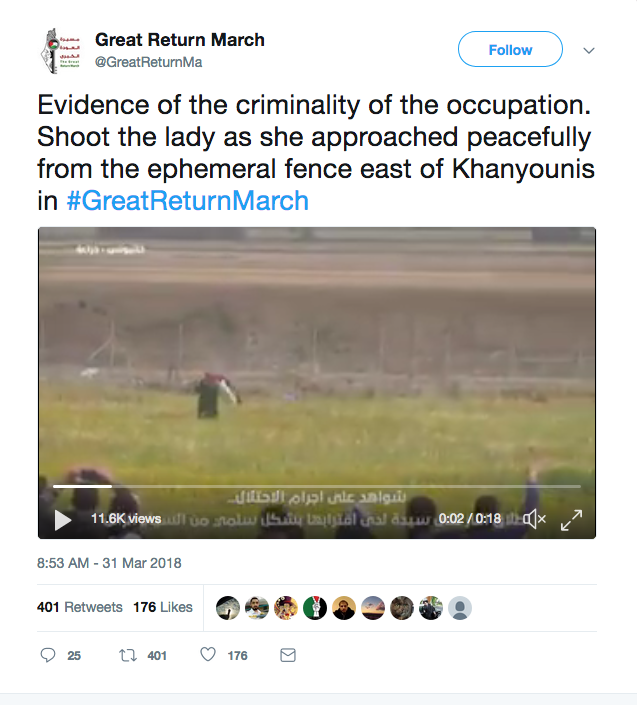 You can see the female protester carrying her flag at: https://www.nytimes.com/2018/04/01/world/middleeast/israel-gaza-fighting.html Still below. I will leave it to personal judgment to determine the validity of these as well as others you may find. This particular influence skirmish shows how high impact video can be merged with Twitter as a distribution medium to sway global opinion. On a side note, I recently took part in an exercise where part of my role was to develop a Twitter Disinformation Campaign. One of my colleagues and I assumed two different adversarial roles and generated a number of “Tweets” (they weren’t really on Twitter, but on an internal closed system) ranting against the Americans and their allies in the host nation. I was pleased to see that the good guys picked one of the up and provided some very creative counter-PSYOP. I’ll be hosting a Peer to Peer Session and giving a presentation on the new General Data Protection Regulation (GDPR) of the European Union at the RSA Conference in San Francisco during the week of 16 April. If you’re attending comment on the post!